Testing the AVVT 2A3 required a modificatio in my Powersupply for the Power tube.. Thanks to Jim de Kort, who draw my attention to Duncan Monroe"s Filter Simulation program, I was able dto do this at forehand using my PC to simulate the new lay-out when using the AVVT 2A3. This one wants a 65mA at 250V Vp, which is more hefty than my 16mA at 185V Vp in the 171A case... Using that program resulted in modifying the powersupply to a 16mF (2x8) Oil, 8 He/200mA Choke and 18mF (6+12) Oil, in which the 12 mF is the one directly connected to the plate. This results in a good DC at 65mA.. I modified the powersupply in the 171A scenario to avoid listening and evaluating a powersupply difference. The "new" powersupply resulted in a slightly better lowerend response, the sound was overall the same.... ( though I think it is advisible if using more "difficult" speakers than I use). The first difference is in "glowing" the filament. The 171A had a lead-acid cell, the AVVT 2A3 is used on AC. The structure of the cathode is well balanced, in fact, using 2 capacitors (from cathode to ground) resulted in not being able to minimize hum using a hum-pot... When using 1 capacitor parallel to the cathode resistor I was able to lower the hum to a 1.8mV value, which is sufficient to my system (at 98dB). How does it sound? Well, my first reaction was: WOW power! 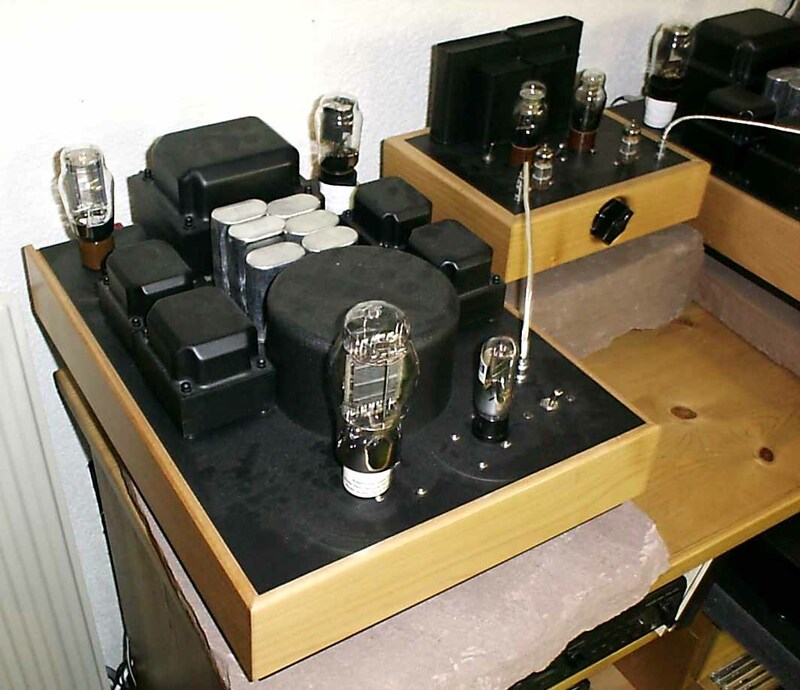 Especially in the mid/lowerend this tube has certainly more definition than my 171A's (no not just in output-power!) BUT! I noticed a certain harshness on all sounds.. This was a known harshness to me! I used a Nichicon Muse (100mF/100V) on the cathode and replaced it by a Black Gate and a Oil (MP) both 100mF/100V, and it was still there... OUT! with the bastards, same experience I had on my 171A composition.... Now there is music! I know! Current feedback, lowered control of speakers...higher Rp etc etc. What I hear is what I believe! If you can do without the cathode-bypass capacitor, DO!!! The AVVT 2A3 is a magnificent tube! It has the detail and stage of the older tubes, but has more punch... One thing I'll try in a while is a somewhat milder setting (185V Vp, 45mA) to lower the current feedback a bit since I don't need the 4.5 Watts anyway, 1 watt makes Rob Happy! Stay tuned!